Mark your calendars for this year’s annual Summerville Tour of Homes on October 21st and 22nd. We are celebrating our 40th year, and things are lining up to make this a great event. Your neighbors are again graciously opening their homes. Also, we have secured a very interesting home in progress that will not disappoint. This year is also the 100th year anniversary of St Mary’s Church, and they have agreed to be a part of our tour. Following the success of last year’s Georgia Grown Village at Summerville, we are again inviting gourmet food vendors, chefs and artisans, both local and from throughout the State of Georgia, to be a part of our Village. There will also be beer, wine and spirit tastings which were a huge part of last year’s success. The village will be open both days of the tour. So please come out and support your neighborhood by shopping in the village, touring the homes and volunteering to help with the tour. We promise it to be a fun event! All Sales Final – Tour held rain or shine. will be provided and required at some homes. The Annie de Prairie Appleby Branch Library, which now houses over 35,000 books, was built about 1830 by Judge Benjamin Warren. 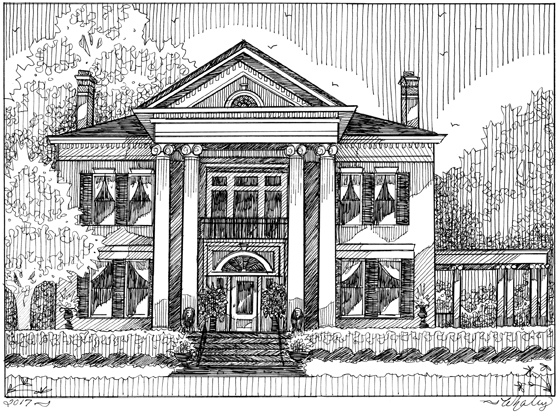 He chose Greek Revival architecture, which was popular in the South at the time. This home was one of the first built in the neighborhood known as Summerville, as Augustans sought to escape the heat and disease of the climate along the banks of the Savannah River. The original house was symmetrical with two rooms on either side of a wide central hall upstairs and downstairs. The main floor was set high above a basement which housed servants' quarters and housekeeping. The original rear entrance of the house would have been a mirror image of the front. For protection from fire, the kitchen was in an outbuilding. After Judge Warren's death in 1871, his wife sold the house to the Montgomery family. It remained in that family until 1919 when it was sold to William P. White. In 1928, the home was purchased by Scott and Annie de Prairie Appleby. The Appleby's added the rear wing which housed the ballroom and a large upstairs bedroom and sitting room. The original rear portion was lost to the addition. 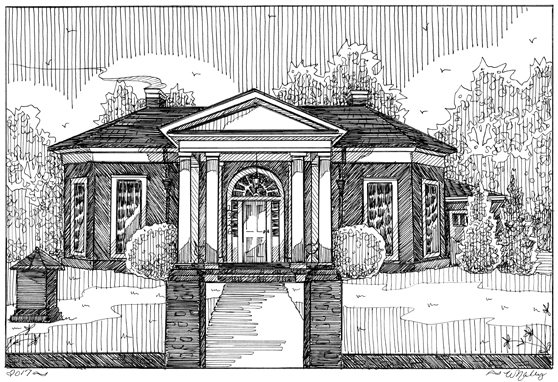 The new portico was designed and constructed to maintain the classic proportions of the home. After thedeath of his wife, Mr. Appleby and his son, James Scott Appleby, gave their home to the city of Augusta and Richmond County to be used as a library. It opened in 1954. The garden area in the rear of the house is now used for Evenings in the Appleby Gardens, a series of concerts and cultural programs held each summer. Begun in 1955, the series is funded, in part, by the Scott and Annie de Prairie Trust fund. The Library today is alive with people of all ages and is a center for the Summerville neighborhood. To many who regularly pass through Summerville, the house at the corner of Walton Way and Johns Road has been a mystery. Following extensive renovations begun by the previous owner in 2001, the house sat dormant for the next several years. When the Allgoods purchased the home in 2014, substantial renovations were necessary to restore its original charm and to make the home livable again. The entire infrastructure of the house is new, including new HVAC, wiring, plumbing, and insulation. The main floor consisted of six rooms and a separate staircase at the back of the house. Three of the existing rooms were combined to create the space that is now the current kitchen. The second staircase was removed and a third floor was converted to attic space. The Allgoods also added a powder room under the main staircase and two additional bathrooms upstairs. The iron fence surrounding the property was completed in 2016. As with the Kelehear residence immediately behind it on Johns Road, this house was built on land once owned by the Walker family, whose home, Belle Vue Cottage, still stands on the nearby campus of Augusta University. In 1818, a fourteen acre portion of the Walker estate was sold for $600.00 to John Forsythe, who further subdivided it into four smaller lots. As time passed, the "Forsythe Lots" were further subdivided, and in 1894, the corner property was purchased by Peter G. Burum, a prominent Augusta merchant. Mr. Burum was a Civil War Veteran, and owner of Burum Brothers and Company, a local supplier of grain, feed, and building materials. Construction of his Summerville residence was underway by 1899, and was completed in 1901. The house has seen many changes in the past 114 years. Additions were made to the back of the house, and upper and lower porches were enclosed. A detached building, presumably the original kitchen, was joined to the back of the main house. The house features a shingled upper story with wood clapboard siding on the first floor. A projecting "water table" divides the two vertical surfaces. The balustraded front porch wraps around a large two story turret, creating wide bays on the interior. To the right of the front porch, a two story projection of the exterior wall houses upper and lower twin windows and is capped with a forward facing gable. The metal hipped roof includes built-in gutters. The style of the house has been described as Queen Anne, but also exhibits aspects of the Shingle style. The Neoclassical Revival house at 2627 Walton Way was constructed between 1909 and 1910 for the family of William Martin and his wife, Mary Lou Fleming Martin. The Martins purchased the lot in 1907 for $3,000. This was considered prime real estate in Summerville at that time, and $3,000 was a premium price for an undeveloped lot, which was approximately 1.25 acres. Research has not revealed the name of the architect who designed the Martin's home or the name of the building contractor. Mrs. Martin was the daughter of Robert and Louise (Anderson) Fleming. William Martin was the brother of Mrs. Leonard Phinizy. He was descended from the noted Martin family for whom Martintown in Edgefield County was named. The Martins had one daughter, Louise Martin, who was first married to William Marshall and later to Dr. Harvey M. Cleckley. Cleckley gained international fame by his research and writing on multiple personality disorders with Dr. Corbitt H. Thigpen. The movie, Three Faces of Eve, was based on this book. Mary Lou Martin sold the house at 2627 Walton Way to William M. Howard in 1919 for $15,000. The Howards and decedents of the Howards resided in the home until 1950. It was sold to Alice Teresa Bodell Bresnahan for $19,500 at this time. Alice Bresnahan was the wife of John Augustine Bresnahan, a druggist in Augusta. John grew up in Augusta. As a boy of 12, John began working as a soda clerk and delivery boy for Mr. E.J. Hansberger. Hansberger's was a long established pharmacy on Broad Street. Before John's 21st birthday, he passed the Georgia Pharmacy examination and upon his birthday, Mr. Hansberger gave him on half of the business. In 1923, John purchased the remaining interest of the pharmacy from the Hansberger estate. The Bresnahan's had no children. John died in his Walton Way home in 1969. Alice died in 1998 at Kentwood Nursing Home in Augusta. As Alice was an only child, their survivors included John's sister, Mrs. Charles H. Weigle, and her children and his brother, Edward S. Bresnahan, both of Augusta. The Bresnahan's ownership of 2627 Walton Way lasted longer than other previous owner, covering almost 50 years. On January 15, 1999, Margaret Dale Williams purchased the home. Margaret improved the property which had suffered neglect during the late years of Mrs. Bresnahan's life. Robert moved from Charleston to Augusta and purchased the house in 2004. Jan and Robert were mailed New Year's Eve in 2015. They have continued to make improvements including a new metal shingle roof, updating an upstairs bathroom and many aesthetic improvements. "Architecture is my delight, and putting up and pulling down, one of my favorite amusements." Jefferson, inspired by his readings of ancient and modern architectural writings and his observations of European structures, created his own architectural style that was distinctively American. It was Jefferson's influence that led to the federal buildings in our nations capitol, Washington D.C., being designed in a neoclassical style. For this reason, architectural historian Fiske Kimball called Jefferson "the father of our national architecture." Kimball, a founder of the University of Virginia School of Architecture and curator of Monticello, Jeffersons forty year labor of love, played an important role in the national recognition of Jefferson's contributions to our architectural landscape. Kimball so admired Mr. Jefferson he designed and built his home as homage to Jefferson's designs. He named it Tusculum (1924), after the ancient Roman city where Cicero penned his classic works. Jefferson greatly admired Cicero, and though separated by hundreds of years, they shared a love of land, liberty and democracy. We are fortunate to have the Jeffersonian style now present in Summerville. The Cheatham home sits on was what was once the Phinizy-Mackie property. It uses the Jeffersonian architectural principles of Monticello and Tusculum as its basis. All three homes have Tuscan columns and cornices, truncated corners, triple hung windows and geometrically shaped rooms. Jefferson considered the octagon to be the perfect shape. The wallpaper in the entrance hall is a photographic copy of the paper in the Dolan-Cheatham house, showing scenes of London from the Thames River. The pine floors were quarter sawn from old beams. The dining room is an octagon. There is a surprise behind one of the mirrored doors. The kitchen has a curved wall. The living room is paneled in white pine. The rug, originally a donation, was purchased from Sacred Heart Cultural Center. The two lower sashes of the triple-hung windows can be raised to make a doorway to the side terrace. The floors in the hall, courtyard and porch are hand-thrown brick. The lead statues represent the four seasons. The tiles edging the planting are antique. Bill and I knew that we wanted to move back to the Hill. However, we wanted to build again but there was one problem, no vacant lots. Then the Daycare lot became available for residential construction and we knew we had found our spot. It was the perfect location, close to our Church and close to the golf course! Jimmy Garren had built for us before and we were happy when he said he would work with us again. Jimmy and I agreed the house needed to be a French-country design, something we had also done with our River Island home. We found a farmhouse brick and came up with neutral shutters to blend in with the color of the exterior. The blue door was copied from a book I saw during a meeting at Garren construction. It took a few tries before getting all the color hues to blend like we wanted. It has become one of our favorite Architectural details. With the help of Wynn Interiors, we chose French fabrics, wallpapers, and painted floors to continue our theme inside. Also, the home was built with a covered back porch that overlooks a courtyard area. The porch is the perfect place for us to relax, watch TV and enjoy a glass of wine. We absolutely love living in this home in beautiful Summerville! By the close of the 19th century, The Village of Summerville had become a winter playground for wealthy Northern tourists, known locally as "snowbirds". John W. Dickey, a local businessman, recognized this as a great opportunity. He very quietly purchased every available acre of land in an area bounded by Walton Way to the North, Old Milledgeville Road to the South, Monte Sano Avenue to the East, and Highland Avenue to the West. Old Milledgeville Road would later be realigned and renamed as McDowell Street. Dickey then hired surveyor Gorden Gairdner to divide the land into 48 lots, and lovingly named two newly-created streets after his deceased wife, Helen and their two-year-old daughter, Glenn. On April 18th, 1900, a plat was filed in the Richmond County Courthouse, and a neighborhood was born. The lot on the Northwest corner of Glenn Avenue and Helen Avenue, as it was originally named, sold in the summer of 1902 to Turner G. Howard for the sum of $2200. In March of 1903, the vacant lot was then resold to two savvy buyers, Marie Louise Jackson and Myra Overall White, for the sum of $1600. These two ladies borrowed $4000 from the Augusta Savings Bank, and with that money, they built a beautiful home. The style chosen for the home is Free Classic Queen Anne. 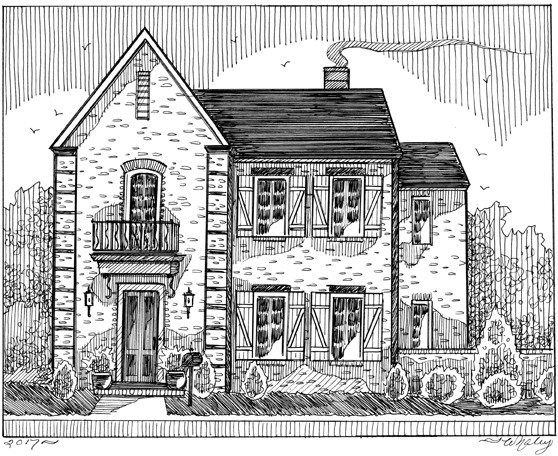 An American adaptation of the earlier Queen Anne style, this style features asymmetrical form with wide porches and eclectic Colonial Revival details. Over the course of its lifetime, this house has changed hands more than a dozen times. Current owners, Nick and Shannon Gladd, recently purchased the home and have begun a full rehabilitation and owner's suite addition. The Gladds and their three growing daughters are excited about the project, and the prospect of living so close to school, church, family, and friends. Please enjoy this "in progress" home tour through one of the most iconic houses on Glenn Avenue. At end of the 19th century, Summerville business man John W. Dickey had a vision to develop a neighborhood on the western boundary of Summerville. He was anticipating an influx of Augustans escaping the heat, floods, fires and mosquitoes of downtown for the clean, cool healthier air on "The Hill." Even streets and buildings were named with a nod to this belief. Dickey purchased, from various owners, 40 acres bound to the North by Walton Way, to the South by Old Milledge Road (later renamed McDowell St), to the West by Highland Avenue and to the East by Monte Sano Avenue, translated Mount Health. He divided this tract into 40 plus lots, and with his vision realized the people came. In July of 1915, the Bowen family of Augusta bought a lot on the West side of Monte Sano and hired JB Storey to design their dream home. There was one important stipulation: no basement. Mrs. Bowen had lived through floods downtown and did not want water under her house ever again. Builders Mobley and MaGruder were hired and by 1916 Gus and Nannie Bowen, along with their 3 year old daughter Susanne moved to 1335 Monte Sano Avenue, where she remained for the next 92 years. 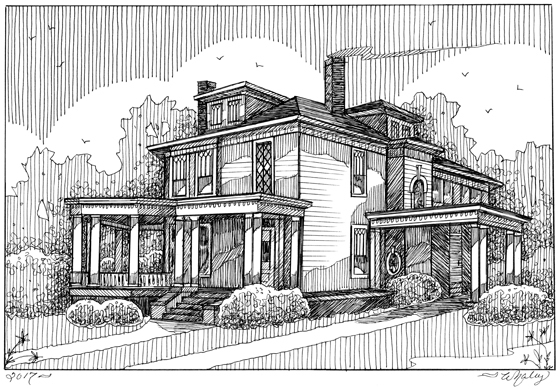 This home was designed in a typical fashion of the time the American four square. The house is solid brick with limestone window sills, wide front porch, porte cochere, and slate roof. The interior of the house features 10 foot ceilings and transoms over doors to most rooms. Wainscoting and cornice mouldings are in the front reception room, front stairwell and dining room. The house includes seven fireplaces and the flooring is the original Georgia pine. A sleeping porch, designed by architect John M. Campbell, was added in 1918. After buying the home in 2010 from an interim owner, the Tribby's embarked on a renovation project to bring the home up to current standards, but maintain its original charm. With much forethought and research, the Tribby's used Historic Preservation Grants and Guidelines to make their dream a reality. In 2012, Garren construction brought in skilled craftsmen and began renovating the house. Fortunately, minimal restoration was needed as the house was in good repair. Part of the back wall was removed to allow for an eat-in kitchen. A bathroom, laundry room and master suite were created within the existing floor plan. The current garage is a replica of what once stood in the back yard. With the project completed, the Tribby's invited Miss Bowen to come for a visit and she gave them the utmost compliment "You children have done a good job." The Tribby's could not have been more happy. Please enjoy touring their home where you will hear more stories as told to them by Miss Bowen. The St. Mary on the Hill Church community was created a hundred years ago. In 1916, a devastating fire in downtown Augusta destroyed 32 blocks containing 746 buildings, both businesses and residences. Rather than rebuilding downtown, many residents, including Catholics, elected to move west to "The Hill." At the time of the fire, the downtown area consisted of two Catholic parishes – St. Patrick's and Sacred Heart. Competition for the displaced parishioners by both parishes, as well as the influx of Catholic soldiers to Fort Hancock during World War I, prompted Bishop Benjamin J, Keiley, in 1917, to establish St. Mary's and instructed Father Patrick H. McMahon to build a church. He selected the present site on Monte Sano Avenue and the church was constructed during the pastorate of Father James A. Kane in 1919. The parish prospered in the 1920s and survived the challenging 1930s and 1940s. As the population of West Augusta grew, St. Mary's also thrived, counting a congregation of over 1,000. By 1954, the parish had outgrown the church built in 1919 and the building of a new church was undertaken. Father John Kennedy directed the effort and the first Mass was said on December 8, 1955. The beloved old church was refurbished and continues to serve as the Parish Hall. Due to financial constraints, the interior of the church was basically left unfinished, with open-faced concrete blocks and exposed steel beams. Msgr. Daniel J. Bourke enhanced the building with the installation of the beautiful stained-glass windows in 1969 and Father Michael Delea added the pipe organ in 1978. Father James Costigan came to St. Mary's in the early 1982 to find a vibrant faith community with an old church in need of refurbishing. Using a collaborative management style, Father gathered the ideas of parishioners, liturgists, and architects in planning for the task. The church was masterfully designed to reflect changes mandated by Vatican II but still retained cherished elements of the old church. During his pastorate, Father Costigan began the practice of Perpetual Adoration and promoted Discipleship through Stewardship. In 2002, Father Gerald Ragan became pastor. Not a brick and mortar builder, although the Columbarium was conceived and built under his leadership, he was more oriented toward building a spiritual community of disciples, as evidenced by the active participation of parishioners in a wide variety of ministries. Throughout its history, the parish has promoted and supported the Catholic education of its young parishioners, including the operation of St. Mary School since 1961. St. Mary on the Hill Parish is now 100 years old. Many religious leaders have come and gone. All possessed unique qualities of leadership which were providentially appropriate for the challenges of the times. Today, we have a robust community of over 2,400 families. The Parish has been truly blessed and confidently look forward to a bright, vibrant, and faith-filled future.